Finding the perfect holiday destination is not always easy. But if you are looking for a relaxing and charming Swedish getaway, look no further than Dalarna. Dalarna, also known as Dalecarlia in English, is just a few hours’ drive from Stockholm, yet with its sweeping scenery and quaint charms, it can seem a world away from city life. We have spent three summer holidays in Dalarna (pretending that our rented stugas are really our own, and BBQing and lake swimming daily like true Swedes!). Here come a few of our top tips for a fantastic family break in Sweden’s lake district. If you’ve never swum in a lake before, this is a great one for beginners and little ones. Shallow for what seems like miles, and serenely beautiful, Lake Orsa provides hours of fun. 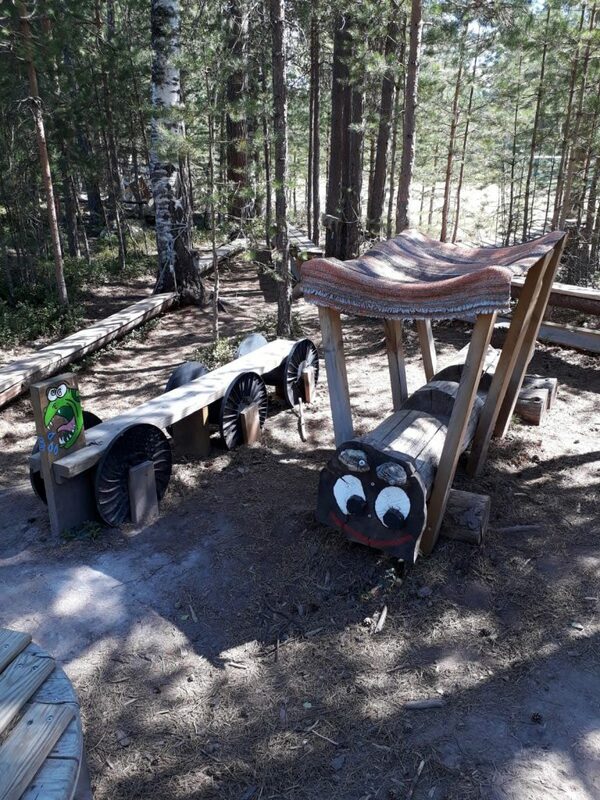 We rented a holiday stuga at Orsa Camping, a large campsite situated directly on the lake, and our kids spent a delightful week building sandcastles and mudpies in the lake, going crazy on the trampolines and learning to swim in the site’s three pools. Whilst Orsa itself is small, it hosts a fun street music festival, Orsayran, each Wednesday during summertime. Orsa is also home to my favourite café in all Sweden – Orsa Kaffestuga, which serves delectable fika in a stunning stuga from the 1800s, decorated with olden days artefacts I could spend all day looking at. Do you own a dalahäst yet? A Dala horse, the unofficial symbol of Sweden and surely its best selling souvenir? In Nusnäs you can visit the factory where the original Dala horses are made, find out their history, and watch them being carved and painted. Children (and big kids!) can ride a giant dalahäst, and have a go at painting one themselves, or watch as one of the skilled craftspeople paints their name onto a horse of their choice. The real things aren’t cheap, but the craftsmanship is excellent, and they are truly a classic Swedish souvenir. While you’re in the area, check out Nusnäs’s Gamla Skolan Café for an outstanding lunch made from local produce! If you are anywhere near Mora with kids, you MUST make a detour to the Troll- and Clownstigen. This truly impressive playground is so endearing and creative that it won’t fail to put a smile on your family’s faces. Created out of recycled, upcycled junk and natural materials, it takes rustic charm and quirky inventiveness to new heights. It’s not a tourist attraction as such – simply a local playground, but if you’re in the area, it really is well worth the visit. This charming nature reserve and visitor centre at the top of a mountain giving spectacular views over Lake Siljan is a great place for kids to learn about Dalarna’s flora and fauna. With a boardwalk mini hike path ideal even for preschool age children, a cute animal trail to follow, and a variety of workshops and activities in the visitor centre, Naturum is a very enjoyable spot for a half-day trip, and is easily reachable from Leksand. Located around 20km from the charming town of Rättvik, Styggforsen is a great morning out for junior explorers. 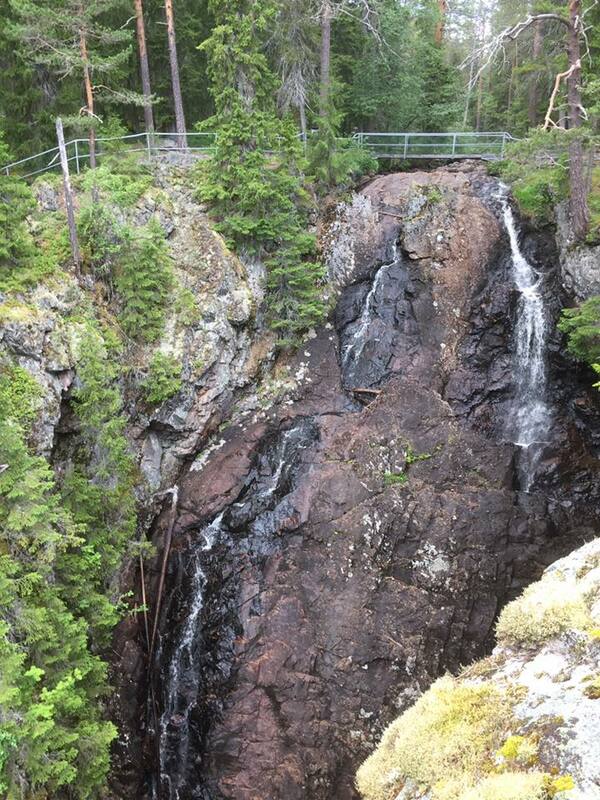 This 36m high waterfall is as picturesque as it is impressive, and the 3/4km hiking trail round the site takes you around the fall from bottom to top and back down again. The trail offers plenty of opportunities to stop and pick berries along the way, and even spend time playing on the stream’s natural stepping stones, and your mini adventurers can be rewarded for their bravery with local ice cream and waffles in the adjacent café. Dalarna has so much to offer that I could go on for pages! I hope you might be tempted to visit some of our favourite spots, and perhaps add in some of these classics too. Hej! I’m Sarah. I’m from the UK and I live in Uppsala with my husband and our two children. I am a language teacher and freelance writer, and my husband is a researcher. It was his work with moss (yes, moss!) which brought us to this beautiful country, and we absolutely love it here! Highlights of our life here so far include experiencing the midnight sun in Abisko during an epic Arctic Circle roadtrip, blissful summers in Dalarna, and meeting Sweden’s Crown Princess Victoria (along with Prince William and the Duchess of Cambridge!) in Stockholm’s historic Gamla Stan.